FEW people who take an interest in our affairs can be anything other than very disturbed about the stories coming out of the House of Commons about politicians’ expenses. We share the concerns and would hope that such behaviour doesn’t percolate down to local councils - although we know it does albeit on a smaller scale. If we are elected we pledge to be totally open about this matter and will publish all payments and expenses claimed over the course of the year on this website. “I will also press for this information to be easily obtainable on the council’s website - which isn’t the case at present,” said former county councillor Steve Dancey. “We have already said that we won’t claim car expenses for travel to County Hall as it is within easy reach of Trowbridge train station. “Councillors can also receive payments for sitting on the police authority, fire authority, housing associations and who knows what else - sometimes running at many thousands a year. “All of these payments must be declared together with any associated expenses and totted up to reveal how much someone is paid for public service. 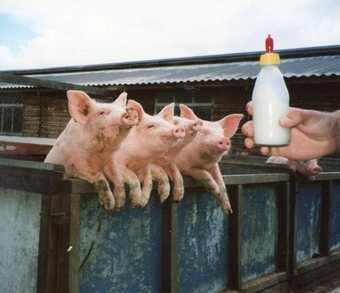 Pictured: Unlike some party politicians we won’t milk the system and put our snouts in the trough.